Born: February 12, 1809, in Hodgenville, Hardin County, Kentucky. Died: April 15, 1865. Lincoln died the morning after being shot at Ford's Theatre in Washington, D.C., by John Wilkes Booth, an actor. To the majority of the North, President Abraham Lincoln was a great president, uniter, liberator, and staunch American. To most of the South, however, Lincoln was a tyrant, invader, and he trampled (and even trumped) states' rights and the U.S. Constitution. (See: Governor John Ellis and Cherokee Declaration of War Against the Union: The Tyrant Abraham Lincoln). Almost thirty years before the Civil War, South Carolina threatened to secede from the Union. Why? Because of High Tariffs and not because of slavery (see Nullification Crisis). Later, when the South desired to secede, this was President Lincoln's response to secession, not slavery, in his First Inaugural Address on March 4, 1861: "No State, upon its own mere motion, can lawfully get out of the Union." Lincoln was adamantly concerned about secession and not about slavery. President Lincoln's Emancipation Proclamation of 1863 did not free a single slave, and, issued only after the Confederacy seemed to be winning the war, Lincoln hoped to transform a disagreement over Secession into a crusade against slavery. 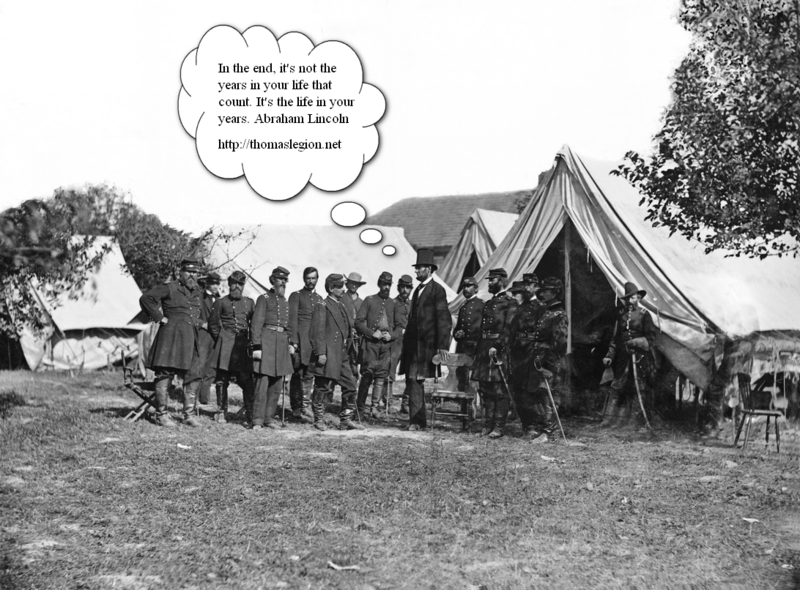 President Lincoln with Gen. George B. McClellan and group of officers at Antietam, MD. The proclamation, which also permitted and kept slavery intact in the border states, was a political decision to block the South from gaining recognition from England and France (The Trent Affair, Preventing Diplomatic Recognition of the Confederacy, and American Civil War and International Diplomacy). Whether slavery was intact or abolished, he stated that either was completely acceptable in order to preserve the Union. Lincoln, who had previously obstructed the U.S. Supreme Court from convening and ruling on secession, merely invoked "freeing the slaves" midway through the Civil War as justification to preserve the Union. As president, he was completely and unequivocally pro-Union. So, was the war about freeing the slaves or denying Southern Secession? (See Southern States Secede: Secession of the South History.) Lincoln also didn't receive a single Southern electoral vote. In addition, Lincoln unilaterally: declared war without the consent of Congress, suspended habeas corpus, arrested scores of political opponents and newspaper editors, and deployed troops to New York City to force conscription on an unwilling populace. President Lincoln warned the South in his Inaugural Address: "In your hands, my dissatisfied fellow countrymen, and not in mine, is the momentous issue of civil war. The government will not assail you.... You have no oath registered in Heaven to destroy the government, while I shall have the most solemn one to preserve, protect and defend it." Lincoln never let the world forget that the Civil War involved an even larger issue. This he stated most movingly in dedicating the Soldiers National Cemetery at Gettysburg (commonly referred to as "The Gettysburg Address"): "that we here highly resolve that these dead shall not have died in vain--that this nation, under God, shall have a new birth of freedom--and that government of the people, by the people, for the people, shall not perish from the earth." Lincoln won re-election in 1864, as Union military triumphs heralded an end to the war. In his planning for peace, the President was flexible and generous, encouraging Southerners to lay down their arms and join speedily in reunion. The spirit that guided him was clearly that of his Second Inaugural Address, now inscribed on one wall of the Lincoln Memorial in Washington, D.C.: "With malice toward none; with charity for all; with firmness in the right, as God gives us to see the right, let us strive on to finish the work we are in; to bind up the nation's wounds.... "